Niobrara Public Schools is an accredited Nebraska Class III school system. It currently enrolls approximately 160 students in grades K-12. The district staffs two full-time administrators, 20 certified employees, and 14 classified staff members providing support service. With many quality instructors, the low student/teacher ratio (8:1) provides local students individualized instruction and attention resulting in higher student achievement. Niobrara Public Schools has received exemplary ratings from the Nebraska Department of Education for their assessment process. Both teachers and administrators have been recognized for their efforts with the S.T.A.R.S. assessment system.Additionally, Niobrara students have also received exemplary ratings (the highest possible) for the results of their reading, writing, and math assessments. During the 2003-2004 school year, 45% of Niobrara students finished in the top quartile (one-fourth) of the nation on the Terra Nova norm-referenced assessment. Seventy-two percent of the students finished in the top one-half of the nation. The elementary school was recognized in 2003-2004 for being a Master School in the nationally recognized accelerated reader program. 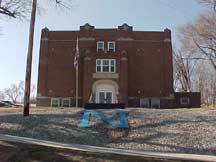 Niobrara was one of only two schools in the State of Nebraska receiving such recognition. On the statewide writing assessment, 94% of Niobrara students received a proficient rating. science classes. Currently, it serves as the maintenance and storage facility. Two new buildings were added in the 1960’s. The first was completed in 1963. It presently houses the K-6 students and teachers as well as the business manager’s office, the superintendent’s office, Title I program, and the cafeteria for the entire school. In 1966 the gymnasium, shop, and music building was completed. This structure is the host to many different activities and events. Niobrara students are offered many different activities to participate in. These include: Band, Boys and Girls Basketball, Booster Club, Cheerleading, Drama, Speech, FBLA, Football, Volleyball, Golf, Honor Society, N-Club, Pom Pom, Student Council, Boys and Girls Track, Vocal, Yearbook, and others. Niobrara is a member of the Nebraska School Activities Association as well as the 17-member Niobrara Valley Conference. 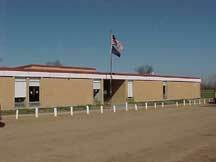 Niobrara Public School was built in 1916. This building now houses classrooms for the high school. A gymnasium and elementary building were built in the 1960s. The final building was added in 1994. This was purchased for $1 from Great Plains Communications and serves as the distance learning center for Niobrara Public Schools. Niobrara both sends and receives several classes each day through this mode of instructional delivery.